Product categories of Seed Processing Line, we are specialized manufacturers from China, Seed Processing Line, Seed Cleaning Line suppliers/factory, wholesale high-quality products of Grain Cleaning Line R & D and manufacturing, we have the perfect after-sales service and technical support. Look forward to your cooperation! We offer full set Seed Processing Line solution. Whole seed processing line is from pre-cleaning, fine cleaning, destining, gravity separating, bean polishing, to seed coating, until seed weighing and packing. The grain seed processing line is composed of several single machines. Base on different grain type and processing aim, we will suggest appropriate grain cleaning machines. These grain cleaning machines are collocated freely. Between each machines, there are Bucket Elevator , Slope Elevator or Other conveying equipment to link up. Easy to setup, machines easy to move and can be placed freely. Save labor, there are middle conveyors to transfer grain from one machine to another. 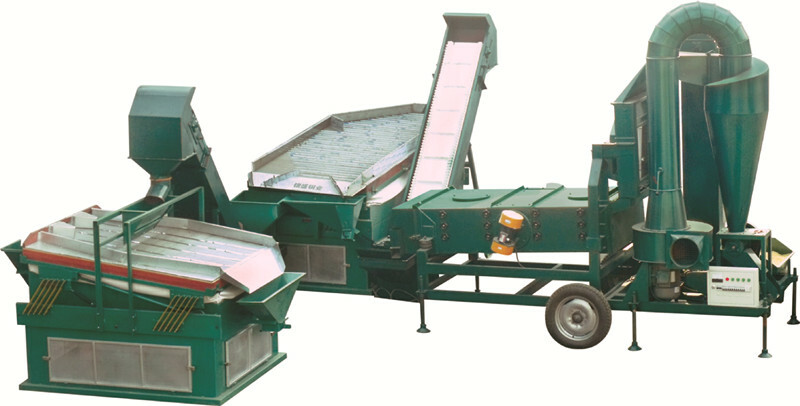 Effective and low cost, single machines compose a seed processing line improve the working performance. Low production cost makes it hot sale. Above flexibility and convenience makes seed processing line makes it becoming hot sales item. Seed processing line installation effect and introduction. This seed processing line is composed of 5XZC-5DH Seed Cleaner & Grader, 5XZ-5B Gravity Separator , DTY Bucket Elevator, 5BY-5B Seed Coating Machine, and DCS-50B Bagging Scale System. Working flow: The seeds are fed into 5XZC-5DH Seed Cleaner & grader first. Seed cleaner & grader will remove the dust, light impurity, oversize and undersize impurity before seed flow into 5XZ-5B gravity separator. During seeds cleaned in gravity separator, the seeds are separated by density difference. The partially eaten seeds, immature seeds, insect damaged seed, sick seeds, moldy seeds are separated from good healthy seeds. Then seeds go on being lifted by Dty Bucket Elevator, falling into the 5BY-5B seed coating machine. During the seed coating procedure, the chemical, fertilizer or other protective liquidity will be coated to seeds' surface and improve seeds' germination rate. Finally seeds being transferred to Weighing Scale . Seeds will be weighted and packed to bags ready for sell. One seed processing line includes several seed processing machines. It can be composed of different single machines freely. Base on client's particular cleaning aim, we will offer customized seed processing line. It is featured of simple operation, flexible and cost effectively. This Seed Cleaning Line is 5 ton per hour capacity. And it consists of 5XZC-5DH seed cleaner & grader, slope elevator, 5XZ-5 gravity separator, and 5XQS-5 destoner. Raw material is fed from seed cleaner & grader bucket elevator hopper. Then bucket elevator transfer raw material to Air Screen Cleaner to remove the light impurity. The dust, straw, husk are removed here by air suction and collected by cyclone. Then raw material fall into sieve trunk. The sieve trunk has several layers. Each layer installed different hole size sieves. These sieves will grade raw material by size. So the oversize impurity, undersize impurity are removed. Seeds from seed cleaner outlet box are received by first slope elevator. This slope elevator transfer seeds to gravity separator. On the gravity table, the immature, eaten, sicken, moldy, shrink seeds are separated from good seeds. As the gravity separator will separated seeds to 3 parts: impurity, mixing seeds, good seeds. The mixing seeds are received by this first slope elevator too. It will take the mixing grain for reflow. The good seeds are being transferred by second slope elevator to the destoner. The destoner will separate the stones, heavy impurity out. Finally you get clean grain from the destoner good grain outlet box.